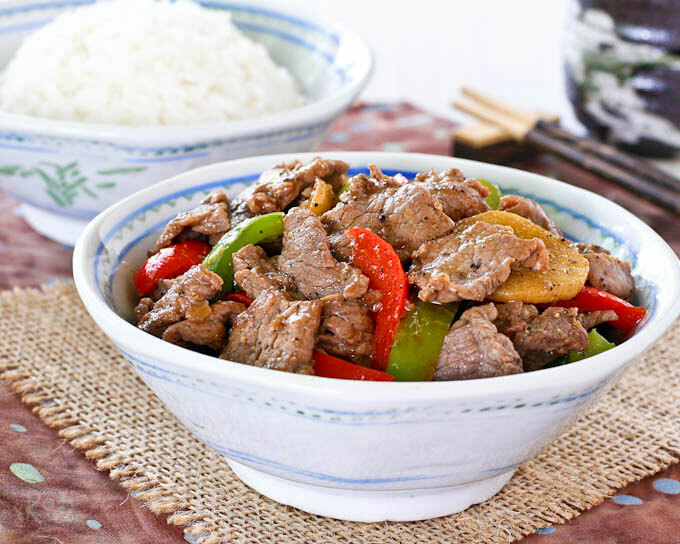 This robust and flavorful Black Pepper Beef Stir Fry combines thin slices of beef with freshly ground black pepper, ginger, and sweet bell peppers. In my post Broccoli Beef Stir Fry, I mentioned that beef is usually paired with green onions or scallions where I grew up. Other popular vegetable pairings include sweet bell peppers, onions, and celery. 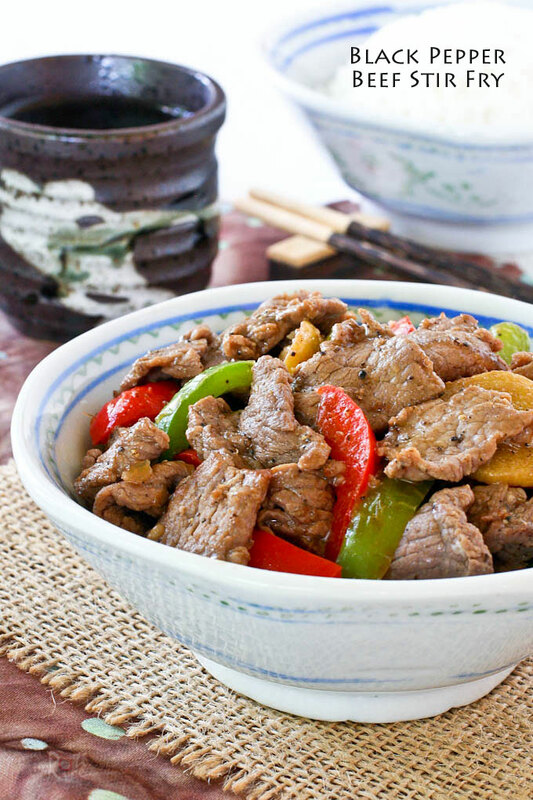 Today’s recipe, Black Pepper Beef Stir Fry uses red and green bell peppers. Even though the Chinese prefer white pepper to black pepper especially in clear soups, the emphasis on this particular dish is the ground black pepper. Its deeper and spicier flavor combines wonderfully with beef which is considered to have a strong flavor. While black pepper is the norm here in the United States, it is not as easily available in Malaysia. Most of the pepper sold there are white peppercorns and ground white pepper. 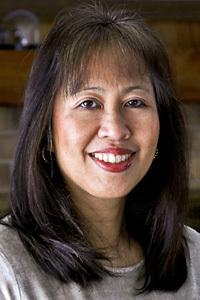 Sarawak on the island of Borneo in East Malaysia is renown for its pepper. Sarawak white peppercorns are prized for their clean white color and gentle spicy flavor. Interestingly according to this source, black, white, red, orange, and green peppers all come from the same pepper plant. They are just picked at different ripeness and processed differently. However, pink peppercorns do come from a different plant. It is best to use freshly ground black pepper for this recipe. Since quite a bit is being used, please do adjust according to your taste. Sliced onions may be added to the mix but I chose to omit it here. I like to use a nice slab of top sirloin steak for my stir fries. It is more easily available than flank steak which usually comes pre-sliced and sold as as stir fry beef. Either one would work. Trim fat from around beef. Slice against the grain as thinly as possible. Marinate beef with soy sauce, Shao Hsing cooking wine, black pepper, cornstarch, and sesame oil for at least 30 minutes in the refrigerator. Heat a wok or large pan with 1 tablespoon vegetable oil. Add red and green bell peppers and stir-fry for 2 minutes. Remove and set aside. Add remaining oil into the pan. Fry ginger for about a minute, then add garlic and fry for another 30 seconds. Add beef by spreading it out in the pan. Fry for about 3 minutes. Return cooked red and green bell peppers to the pan. Stir to get everything well mixed. This takes about 2 minutes. 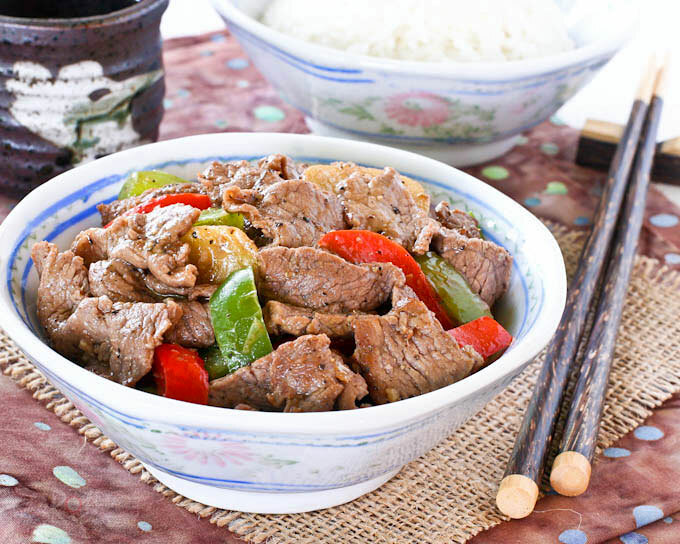 This robust and flavorful Black Pepper Beef Stir Fry is one of our favorite stir fries. It is simply delicious served with plenty of steamed white rice. Do give it a try. Thanks Maria! This quick and easy stir fry is indeed perfect for busy week days. This used to be our family favourite until I added black beans to the dish! Now beef in black beans and black pepper is our firm family favourite. However, we still like beef with black pepper as it has a different flavour altogether. You are so right in saying that black pepper is not preferred in Malaysia, but I use black pepper everywhere now! Adding a little black bean makes the sauce quite tasty but like you said, the flavor is different. This one is nice and peppery. One of my favorite stir fry dishes! These go great with rice. YUM!